An American Pale ale bittered, flavored, and dry hopped exclusively with Citra hops from the American Pacific Northwest. Poured from a growler, minimum head, but great lacing down the glass. Nice pale cloudy yellow. Smell didnt seem very strong but was a mix of some slight tropical fruit and maybe a bit of pine. Taste follows the nose well, very easy to drink lots of fruit flavor, and a bit of bitterness/pine at the end. Great slightly thick/creamy ipa feel, maybe slightly more carbonation, almost perfect. Great ipa, easy drinker, great mouthfeel, but not as much depth to the flavor as the best of the best. Great out of the can also. A: fairly small tiny bubbles white head that settles to a film. Body is a hazy bright orange tan in color. S: Soft hints of cantaloupe and grass and a light maltiness in the background. T: Fairly soft on the tongue pretty juicy light tastes of fruity melon and light grass a little bit of very mild bitterness. M: softer on the tongue medium bodied leaning towards watery with low carbonation. O: not a bad beer at all. 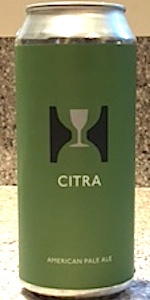 I could see getting tired of the mouthfeel and low carbonation pretty quick but the Citra hops definitely shine. Drank it out of a can so I can;t offer the normal amount of detail. But this was a super refreshing pale ale. Taste notes were big citrus and floral notes. Super crisp. Perfect for a hot day. First Hill Farmstead beer and it did not disappoint.